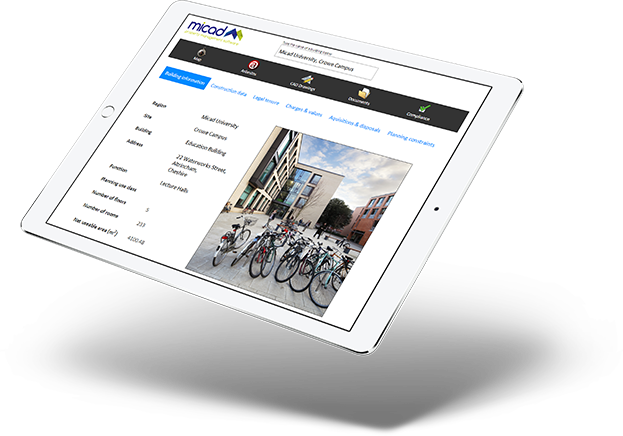 Micad’s comprehensive Leases & Licenses module centralises your legal documentation and diarises key events so you never miss a break option, rent review and much more. It can even link your leased areas directly to an accurate CAD floor plan. The Lease Management module provides organisations with a central management application for all Leases and Licences information. It is diary driven so that all ‘due dates’ are published as an action list in advance of the required intervention. The system provides the ability to email notifications to appropriate individuals and the ability to set ‘buffer’ periods that will substantially reduce risks surrounding the maintenance of due dates. We understand that property management can be a stressful and busy task any day of the week, with the lease and license module, you can stay on top of your legal agreements easily. Original documents can be scanned and linked to all relevant information categories. The database includes comprehensive details for the Lease Agreement and Rental Payments. The ‘Let’ status of each space (e.g. Room) is simply indicated by a ‘traffic light’. Details include occupiers and organisations, Rent Reviews, Break Options and Service Charge Details. Reminders can also be configured as emails to your desktop. In addition, the leased areas for each property can be directly linked with the IPR CAD floor plans. This enables users to clearly see on a live plan which spaces on the floor are covered by the lease agreement. Our Leases and Licenses Module are available on request for demonstrations that are carried out by our expert team. Our demo service has been set up to ensure you’re getting the most out of the software and you’re using the software correctly. For more information get in touch with one of our team today.